I'm in need of a single plane oval port, std deck, BBC intake. Perferably a Dart or strip dominator, any one got one? I'm looking at racingjunk and ebay as well. I'll be selling a Weiand Team G single plane very shortly if you're interested? 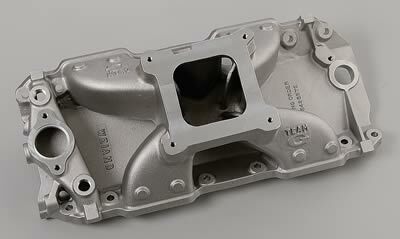 Weiand Team Gs are single plane manifolds, designed to build power in the 2,000 rpm to 8,000 rpm range. Port-matching an intake to your heads can move the power band up another 200 rpm to 800 rpm. They have a raised plenum for increased flow and atomization, extended runners for improved flow velocity (most models), integral bosses for nitrous oxide nozzles (most models), isolated water passages for improved cooling, and cast-in carb linkage clearance. I'll try to call in the next couple of days, gotta get a job wrapped up by Friday...hopefully Thursday afternoon. It's funny you mentioned calling, I was thinking that we haven't talked in awhile. I also have to try to get ahold of Fred to find out if he's heading down your way next month.....I need to take you up an that free pump rebuild.